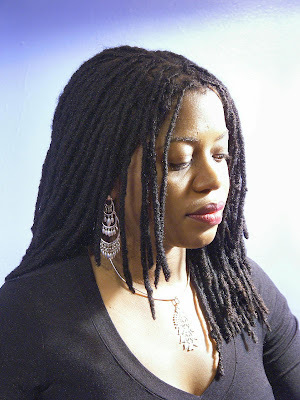 Next up in the Veteran Loc'ers Chime In mini-series is my e-big sister Toshia. I can't remember how I found her blog On the road to Queendom but I am SO glad I did. She has really been such a great loc mentor throughout my journey. Through our Skype talks and my random Twitter whines, she has always been so loving and understanding. 1. How old are your locs? My locs are about 8-9 years, as this is my 2nd set. My first set got taken down while I was in the middle of GA 400 traffic. If anyone has ever taken the route from Atlanta to Dunwoody GA during rush hour traffic then they know the stress I was under. So, I went to work with a head full of baby locs and came back home with half of the back undone. 2. Have you ever thought about cutting them? If so, why? I am going to be honest with you, I have never thought about cutting them, or taking them down. My locs are my crown; therefore I will never cut or take them down by choice. I am Rasta so that may have something to do with it. However, I love them, and they love me. My hair has responded so positively to locing, why would I ever cut or take them down to add on hair style stress? No ma’am. 3. Have you ever combined your locs? Why or why not? Oh my goodness yes, I have quite a few I am combining now. 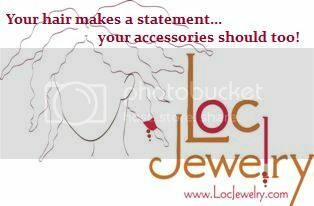 As your locs mature they thicken, and some may not get the memo, so you have to force them to thicken by marrying the two! 4. Fill in the blank: It frustrates me when my locs ________. I cannot answer this lil sis because I adore every aspect and element of my locs. I have loved them since the budding stage…I cherish every stage. Also I have never lost any locs due to traction alopecia. I think it’s because I am very careful, and meticulous with them. 5. 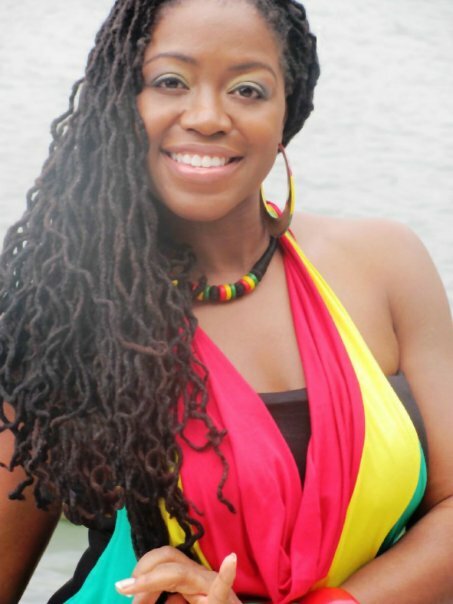 Fill in the blank: I love when my locs ___________. I can answer this….I love when my locs are freshly shampooed….the smells of rose, mint, and hemp fill my nostrils and I am reminded why I am natural. I adore my hair. 6: Any words of wisdom for struggling loc'ers? To loc is to grow patiently. You have to understand the transformation you are coming under. It is not an overnight process just like becoming a mature adult takes time. Your locs are an extension of you, your crown and glory. So being patient with your hair is just like you being patient in any other area of your life. Sure it’s only hair, but for most loc wearers it’s a bit deeper for them including myself. You should not worry about they aren’t growing fast enough, aren’t pretty like the next persons’ etc. You should look in the mirror and thank God for hair, thank your hair for being so beautiful. Take care of it, adorn it, and praise it. Jah Bless! I know. She's wonderful. Aaaand she's an author. Check out her newest release High Stakes. great post. It would be nice if she could share her maintenance routine and products that she uses regularly. 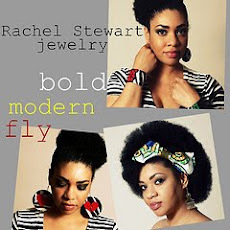 Love her blog! Her spirit just radiates!! Her words are encouraging!! She's soo beautiful! I love this series! WOW, that blog was deep and refreshing! I am one of those new locers who struggle day to day but I aspire to love everything about my hair all the time like she does. It's a journey right? Oh and he regime is a must have!!! Please post it if ya can. This is a great post. I'm really loving her locs! Gorgeous!!! I love Toshia! I "stumbled" upon her site too while looking for some support for my newbies...I love her advice and adore her for her naturalness!! Toshia is one of my loc inspirations! Love her attitude! She's great, this veterans series of yours great idea! Great entry, it was very encouraging and Toshia's locs are gorg!